The same year the German airship Hindenburg crossed the Atlantic, the still-flying-today Douglas DC-3 was introduced to the world. The DC-3 is widely viewed as one of the most significant transport aircraft in history, due to its massive and long-lasting impact on the airline industry, and aerospace engineering. I got the chance to interview Ric Hallquist, the retired Chief DC-3 Pilot for Missionary Flights International who flew and worked on the beefy twin engine transport plane for over 30 years. “Douglas DC-3 Airliner” by Bernard Spragg. NZ. Photo is in the public domain. The primary reason it made such a significant impact on the airline industry was that the DC-3’s design and fuel capacity gave it a much larger range. Its primary competitor of the day, the Boeing Model 247, had a 745-mile range and only a 273 gallon fuel capacity,4 compared to the DC-3’s 1,500-mile range and 804 gallon fuel capacity.3 Obviously, the difference is staggering. 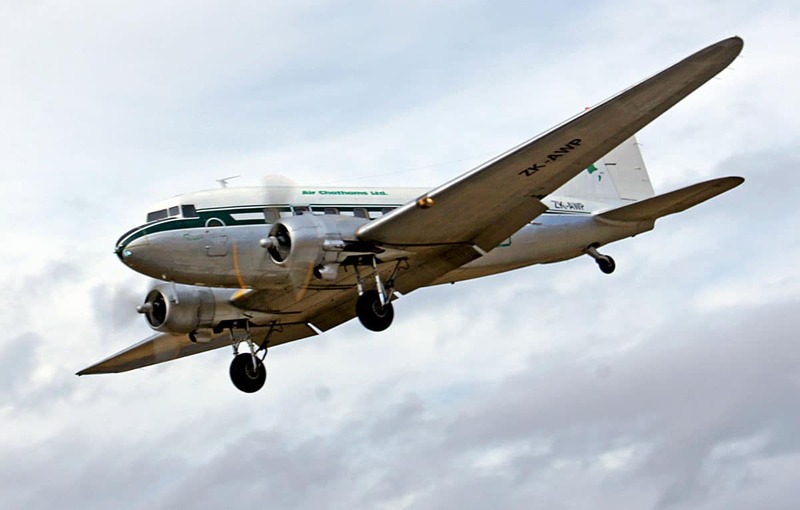 The Boeing had a faster cruise speed and a lower fuel burn, due to it weighing less than half as much as the DC-3, but because of the increased fuel capacity of the DC-3, fewer stops were needed, thus less fuel was wasted on a series of climbs. The crew of the DC-3 was generally made up of two pilots and one flight attendant. The taildragger configuration of the landing gear (retractable oleo strut gear) made for a steep climb up to one’s seat via the single entry door near the empennage. The DC-3 also had a modest bathroom in the rear, complete with a small window. 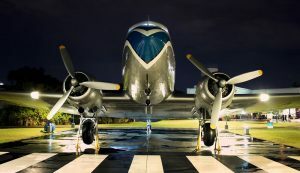 The Douglas DC-3 was originally powered by two massive 1,200-horsepower Wright Cyclone R-1820 radial engines and pulled by two three-blade steel Hamilton Standard (now UTC Aerospace Systems) propellers. The radial engines weighed over a thousand pounds each! Later models, including military versions, used the Pratt & Whitney R-1830 Twin Wasp engine (which also clocked in at an impressive weight of 1,250 pounds). Today, many still-flying DC-3s and C-47s have been retrofitted with PT6s (Pratt and Whitney PT6A turboprop engine) which weigh just about 500 lbs each.11 Still not “light,” but for an aircraft with a useful load of 13,750 pounds, I think the DC-3 can handle it. When the United States entered World War II, they brought with them the C-47, a DC-3-turned-military carrier. 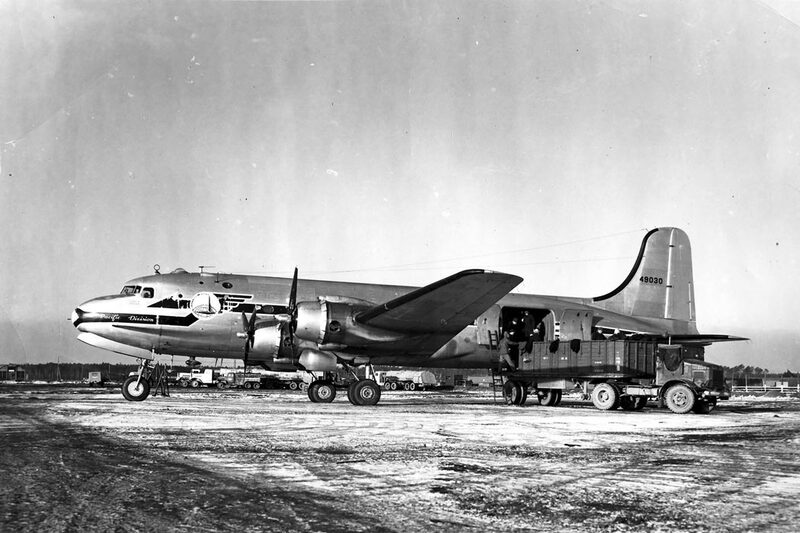 The C-47 had been upgraded with more powerful engines (giving the plane an additional 200 HP) and was refit and reinforced for large cargo shipments. The “Gooney Bird,” as it was nicknamed, officially had accommodations for 32 passengers, 28 combat equipped troops, or 21 stretchers.5 In actuality, the C-47 often carried twice its official capacity in the midst of the war. The US military had over 10,000 C-47s (and their variants) built during the war. Thanks to that, the military surplus that existed after the war contributed to the DC-3 sticking around ‘til today. Ric Hallquist, the former chief pilot of Missionary Flights International (MFI), served as a DC-3 captain and mechanic for years. Though now retired, he says the DC-3 is an honest, straightforward airplane that will continue to keep you on your toes as long as you fly it. Ric compares the handling of the DC-3 to a giant, over-sized Super Cub, or a pick-up truck without power steering. Just like any other taildragger, it has that inherent instability on take-off and landing, but because it’s slow and heavy, Ric says it’s very forgiving. The “big oleo struts are pretty forgiving, pretty gentle” even on rough landings, Ric says, though like most taildraggers if you don’t “tack it on,” it’s prone to “dolphining” over the runway. All that taken into consideration, Ric still believes the Cessna 185 is harder to land! Ric believes the DC-3 has survived (and thrived) for the past 81 years because it was over-designed. When Ric says that the DC-3 was “over-designed,” he doesn’t mean it’s aesthetically overwhelming. He means that back in 1936, the Douglas Corporation had never built an all-metal airplane this large, and so they took extra measures to make it hardy and dependable. The military’s version, the C-47, was even sturdier, with a beefed up airframe and stronger landing gear. 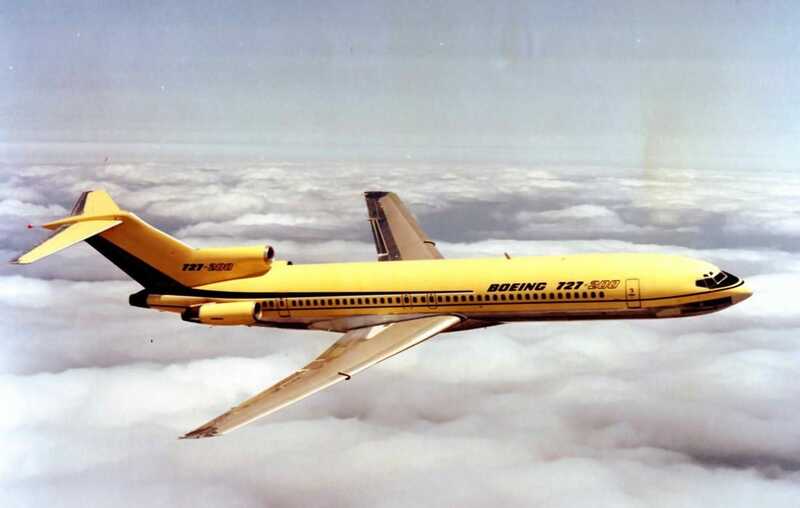 Ric credits some of the airplanes durability to the construction of its wings. 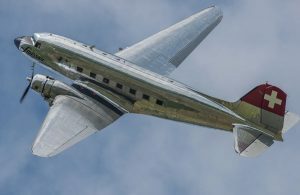 Instead of using ribs and a carry-through spar, as was traditional at the time, the DC-3’s center-wing was made with a honeycomb-like collection of metal boxes connected with “about 360 bolts” and rivets. This lead to a more even load-distribution across the entire wing, allowing the DC-3 to withstand considerable amounts of punishment before the wings even hint at an issue. That being said, Ric did tell me about an AD mandating 2000 hour wing inspections.12 With a plane that old, you can’t really blame them! Again, as an old metal plane, a common issue DC-3s should be inspected for is corrosion. As an uncommonly utilitarian airplane (Ric says MFI can swap between the passenger configuration- which seats 32- to the cargo configuration in one day) it makes sense that the DC-3 would do well in adverse conditions. What doesn’t make much sense is just how well it does. The DC-3 takes no notice of rough, unimproved airstrips, and doesn’t pay much mind to the length, either. Ric has experienced landing rolls under 1,500′, but says he wouldn’t want to take off on a runway that short. Ric has never lost an engine on takeoff but has had an engine fail about 200-300 feet AGL, and the DC-3 handled it like a champ. Owning your own DC-3 is pretty far from practical, but in case you were wondering: a functional, airworthy 1942 DC-3 runs about $4.5 million dollars. EDIT: Ric Hallquist informed me that the $4.5 million price tag is for a turbine DC-3T. “A DC-3 with radials can be picked up for only about $140,000.” Thanks Ric! The Douglas DC-3 made flying as a form of transportation possible for the masses, something everyone is thankful for. It’s affordable, well-made design gave airplane engineers and manufacturers room to innovate and experiment, helping even to create the airliners we all fly on today. The fact that airlines and businesses still use the DC-3 (many of which were built in the early 40s) is a testament to it’s strength, durability, and flexibility as the needs of a nation evolved over time. And for you pilots who would like another notch in your belt, it’s still very possible to get a DC-3 type rating! It just takes patience, physical strength, and a lot of time. However, every pilot who flies the Douglas DC-3 has nothing but good things to say, according to Ric Hallquist. It’s a graceful machine that can handle any challenge you throw at it, and that sort of beauty never grows old. To clarify, the aircraft is often stationed at the Fort Worth Aviation Museum and the effort is being organized by Operation Airdrop. Support this group!